Sacramento Republic FC Head Coach Preki Accepts Position in UK; Will Coach Last Match in Sacramento on July 11; English football manager Paul Buckle will lead as the club’s new head coach. SACRAMENTO, Calif. – Sacramento Republic FC announced today that Head Coach Predrag “Preki” Radosavljević has accepted a position in the United Kingdom and will relinquish his duties as the club’s head coach. 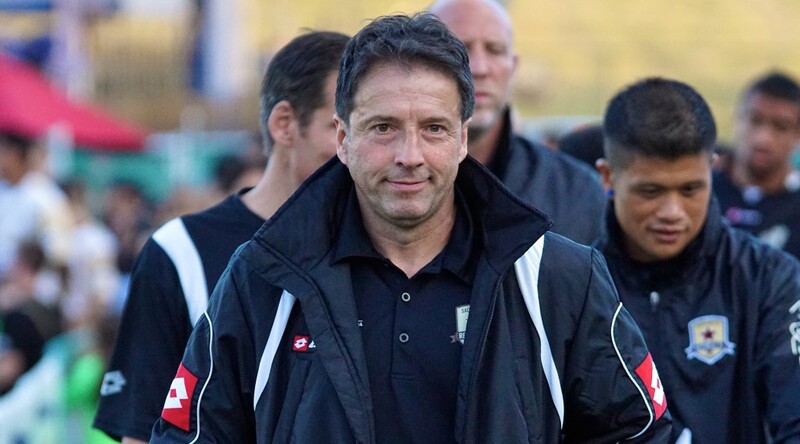 Preki will coach his last match for the USL club on July 11 when Republic FC takes on rival LA Galaxy II. Paul Buckle will serve as Republic FC’s new head coach effective July 12. His experience extends to both playing and coaching football/soccer in England, including a 20-year playing career and over a dozen years and 320 matches as a club manager. He led Luton Town in the defeat of Premier League club Norwich City in the 2013 FA Cup, the first time since 1986 that a non-league club achieved such as victory and the first time in FA Cup history a club achieved such a victory at an away stadium. Buckle has already reported to Sacramento, Calif. and is working closely with Technical Director Graham Smith, Preki, Academy Director Rod Underwood and the entire coaching staff on a transition of duties. His first match as Republic FC’s head coach will be July 14 when the club hosts Premier League’s Sunderland AFC. Preki served as Republic FC’s inaugural head coach and led the club to a 2014 USL Championship. He was named 2014 USL Coach of the Year following an 17-7-4 regular season record and a second place finish in USL standings. Preki’s coaching record during his U.S. tenure is 72-53-35. He is the only coach in U.S. Soccer history to win both MLS and USL Coach of the Year honors. Republic FC currently sits second in the Western Conference with 30 points and a record of 9-6-3 through 18 matches played. Ten matches remain in the club’s 2015 USL regular season schedule along with three friendlies featuring match-ups versus Atlas FC (Liga MX) on July 8, Sunderland AFC (EPL) on July 14 and Newcastle United (EPL) on July 18. To view a full schedule, visit SacRepublicFC.com. San Jose, California – Sacramento Republic FC got off to a quick start and in just the 5th minute were awarded a penalty after defender Emrah Klimenta was tripped in the box. Midfielder Rodrigo Lopez, playing in his first match since May 27, stepped up the box in the 6th minute and sent a hard shot into the right side of the goal, past San Jose keeper Bryan Meredith who dove left. San Jose took control of the match following the early Republic FC goal and had chances in the 10th, 14th, 22nd and 29th minutes. 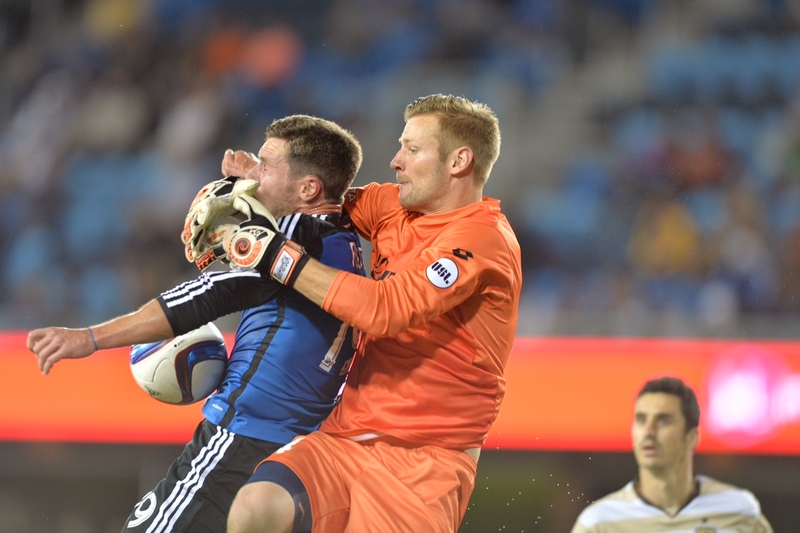 Republic FC goalkeeper Patrick McLain made two saves and two shots were just wide as San Jose looked to close the gap quickly. Republic FC would find a few more looks at goal in the half, tying San Jose with five shots in the first half. The strongest look for a second Republic FC goal came in the 44th minute when forward Cameron Iwasa got behind the defense and sent a low cross to the middle of the box. Forward Justin Braun received the cross, but his shot was blocked by the San Jose defense. Lopez sent the rebound on goal as well, but against the defense stood strong keeping the match 1-0 going into the half. 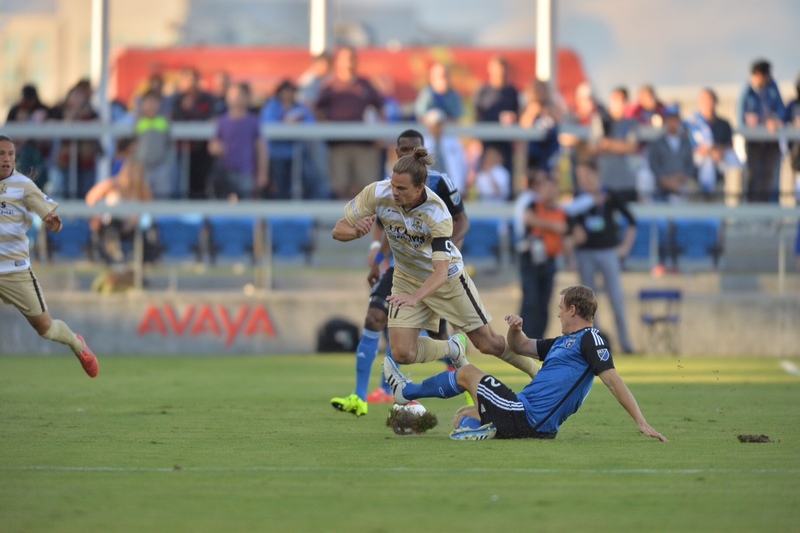 Republic FC again came out strong in the second half and doubled their lead in the 54th minute. Klimenta took a lofted pass from Lopez in the back corner of the box, balancing himself before sending a low hard hit ball under the diving Meredith and into the back of the net to put Republic FC ahead 2-0. San Jose would roar back, however, late in regulation. In the 74th minute San Jose defender Victor Bernardez sent a cross into the middle of the box that found forward Mike Fucito. McLain was able to block the shot by Fucito but an onrushing Chris Wondolowski cleaned up the rebound making the score 2-1. Wondolowski would strike again in the 79th minute to even the match. Defender Marvell Wynne fought his way past the defense and sent a hard cross into the box which Wondolowski was able to head past a diving McLain, pulling the Earthquakes even 2-2. The match would remain tied at the end of 90 minutes forcing extra time. Both clubs has chances to scoring in overtime, including open looks for Republic FC substitute forward Adnan Gabeljic and Wondolowski, but neither team could find the net forcing a penalty shootout. The first two penalties were goals for each side with Lopez and Nemanja Vuković scoring for Republic FC and Wondolowski and Bernardez scoring for San Jose. In the third round both keepers recorded saves. In the fourth round McLain would make a save while Gilberto converted for Republic FC making it a must-make penalty for San Jose midfielder, and Granite Bay native, Tommy Thompson. Thompson would score setting up Klimenta with a chance to win the match for Republic FC. Klimenta sent a low driven shot toward the left side of the goal, but Meredith guessed correctly and made the save forcing the match into sudden death penalties. The sixth and seventh round of penalties looked much like the first two rounds with David Estrada and Gabeljic converting for Republic FC, while Koval and Barrera converted for San Jose. Defender Shaun Francis scored in the eighth round, putting the pressure on Republic FC defender James Kiffe, who skied his attempt over the crossbar ending the match with San Jose winning 6-5 on penalties. Republic FC will return to USL action on Saturday, June 20, in a battle of top Western Conference teams, when they take on Oklahoma City Energy FC at Bonney Field. Kickoff is 8:00 p.m. The match will be broadcast on CW31, KHTK Sports 1140 AM and streamed live at SacRepublicFC.com/matchday. Tickets are available at Ticketmaster.com.